OK, yesterday there were presentations during lunch but I ignored them to talk to a friend and work on digesting <laughter>. Today (Like Thursday) there were two presentations. There is a vendor Space Sciences Corp which has built a hovercraft flying saucer that seats one. The presentation was delightful with both illustrations of proposed uses and actual photos of the current model. It's a wonderful individual craft. They have a three man prototype which has been built and they are looking at supplying tourist transport for Spaceport America. I was just blown away and the presenter was a very tall African American in a cowboy hat, range attire and boots. The business is housed in New Mexico and can be found at www.spacesciencescorp.com There's not much on the site yet, but I'm hoping they will post more pix of the hovercraft. After lunch, the panel included the space port managers including Karin Nilsdotter for Spaceport Sweden. 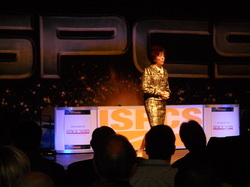 It was she who brought up ITAR as the major item standing between true collaboration between the spaceports. I went and looked up ITAR ... yipe! It's basically the regulations that say what is and is not considered "military" style invention which cannot be shared with other countries. The razor edge one walks when dealing with the kind of technology the commercial space corporations build and invent on a daily basis is frightening. Communications satellites bounce back and forth between DOD and Commerce somewhat like a ping pong ball at a Chinese competition event. I got dizzy reading about it. Spaceport Sweden has a lot going for it in it's arctic circle placement. Very cool, and not just because of the arctic weather! I was really looking forward the the following panel, but whatever bug or bit of food I'd caught that disliked me put an end to my attendance. The most I got out of it was that NASA is fully supporting the private vendors in space flight to get away from depending on the Soyuz program for transport and to bring those flight and cargo delivery dollars back to the US where it will do our economy some good. That was the end of my attendance. I took a few pictures after lunch while sitting in the sun trying to see if warming up would shoo off the discomfort. It didn't and I bade farewell to the names and movers in the area of space flight, spaceport construction and space experience. I'm already figuring out how to attend next year in the hopes that I might actually get to go out to the space port itself and maybe shake hands with Sir Richard Branson, assuming White Knight and the space ship 2 aren't off on a mission to take cargo and crew to the International Space Station. 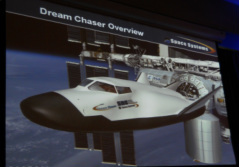 This is an artist's rendition of the Dream Chaser. I've got one of the model, but it's out of focus. <sigh> This one is a reusable cargo and crew delivery vehicle. Very nice. Looking at 2014 for full functionality. This gentleman did a very interesting presentation on how NASA is designating several of the landing sites on the Moon as historical sites and what they are doing to protect the sites. There is also scientific information that can be gleaned from the sites including dust issues, micrometeorite strikes and whether the extremes of temperature have had any effect on the materials left on the lunar surface. Pat Hynes, first day introduction and welcome to the Symposium. 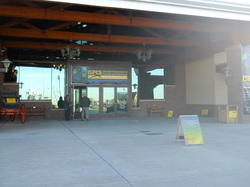 the inside exhibit hall. I couldn't quite get back far enough to manage to get the entire banner ... Sigh. Bigelow Industries has designed modular spaces to be configured to the client's needs for space stations or on other celestial bodies: like the moon, Mars, and outposts beyond. This is a bit blurry, but the idea is brilliant! My updates during the day got waylaid by a digestive imposition. Sorry. Laurie Garver was, as noted before, an exhilarating speaker. She is upbeat and fully aware of how important the new race for space is. We were beating the drums a bit during her presentation;. As she said, we want to be the leaders in this new journey. We will happily join with others to explore and even exploit where necessary, the resources of the other celestial bodies, but for the technologies and the actual dash into space, we want to be the leaders again. Our private companies are building on the beginnings NASA gave us, with one of the best safety records for space travel on the planet. from the time we started manned travel in space until now the US has lost one Mercury capsule and occupants on the training platform and two shuttles: one on lift off and one on return. For over 40 years, that's a good record. We lose more airplanes than we do space vehicles. 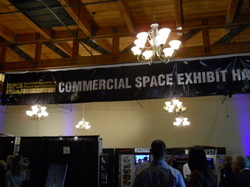 Ms. Garver was followed by a networking break and then a panel on growing business for spaceports. The director of Spaceport America and the CEO of Spaceport Sweden were both on hand, as well as the directors of Kennedy Space Center in Florida. Spaceport Sweden is located above the arctic circle in Swedish Lapland and offers spectacular views including the Aurora Borealis and the long summer sun. The town also hosts the annual Ice Hotel, but that's another story. All of the panel agreed that tourism, into space and to the space ports them selves, is a very important part of their planning. They were also agreed on Orbital travel being the largest portion of their future services as Suborbital point to point travel can be handled by major airports and does not need the facilities of a full service spaceport. After this discussion, we broke for lunch. Mexican salad with black beans and corn; green enchiladas (which is mostly cheese sauce, green chile and corn tortillas in a sort of caserole), chicken or beef fajitas (the meat is marinated and cooked with onions and bell peppers, served in a small warm tortilla) and the toppings included shredded cheese, fresh guacamole and salsa. There was also green chile cornbread and the deserts were much like yesterday's: lemon cheesecake on a white cake base, chocolate cheesecake on a chocolate cake base and something that might have been chocolate mouse. After the problems with the underlying cake yesterday, i gave the desert a miss. Besides, there were M&Ms and peanuts for snacking on outside the meeting hall. Breakfast was good this morning. Eggs, cheese and green chili! 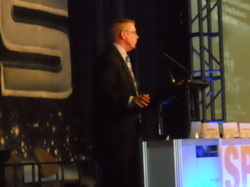 More important, Laurie Garver as keynote speaker, NASA, etc. Noted final shuttle flight in July. Government has renewed NASA's funding and focus. Human exploration of space. 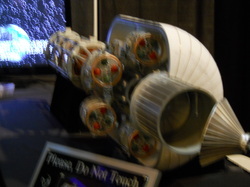 Deep space rocket, deep space crew vehicle, leading to more human exploration of space. ISS through 2020. Non-profit organization established for scientific experimentation. commitment to an asteroid and then to Mars. Satellites to observe Jupiter, the sun, and other celestial bodies. 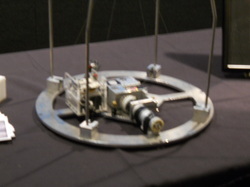 Developing networks of personnel as well as machines. Emphasis on STEM fields for students. Provide economic growth. Partnering with American companies to deliver payloads and personnel to space rather than with other governments. Investing tax dollars in national companies to provide jobs, etc in the US. Wow.